The development of new approaches is often challenging, but is also critical to gain further insights that cannot be accessed by existing methods or technologies. In this study, we borrowed a technique initially developed by the group of Alice Ting for studies in eukaryotic cells and mitochondria. This technique is based on the covalent biotinylation of proteins at the proximity of an engineered variant of the soybean ascorbate peroxidase, called APEX2. Biotinylated proteins can be then enriched and identified by mass spectrometry. We adapted this technique in Escherichia coli cells in order to identify partners of the highly dynamic TssA protein that is involved in the different stages of the assembly of the Type VI secretion system (T6SS). The T6SS is a fascinating machine widespread in Gram-negative bacteria. It assembles a spring-like structure that can be compared to a crossbow or speargun, and used to inject effectors into target cells upon contraction. The APEX2 approach did not only allow to provide further insights on the assembly pathway of this multiprotein apparatus but also revealed a new player in T6SS that acts as a latch for the nano-crossbow. When I joined Eric’s lab during my second year of master thesis, the team had published a ground-breaking study on the TssA protein, demonstrating that this protein associates with the T6SS tail and suggesting that it incorporates new tube and sheath subunits from the distal end. However, the model needed to be tested. Eric came with two different projects: the first one was to adapt a new technique that has been used in landmark papers from the Alice Ting group, APEX proximity-dependent biotin labeling (see illustration), in order to determine the proximity partners of TssA. Eric has always been interested to adapt eukaryotic-based methods to gain further insights in bacterial machineries (remember the ChIP-like TrIP assay he adapted when a post-doc in Peter Christie's lab). The idea to adapt the APEX technology came during a crêpe-cider discussion with Lisa Rucks and Scot Ouellette (University of South Dakota) after a Ph.D viva in the group of Daniel Ladant at the Pasteur Institute in Paris, who were developing the APEX technology to study Chlamydia effectors, and further discussions with James Sturgis. Because nobody has used this approach in bacteria, it was a risky project! The second project was more straightforward and was focused on the characterisation of a gene localised downstream the T6SS gene cluster in enteroaggregative Escherichia coli and encoding a TssA-like protein we named TagA. This gene was initially identified by Laure after a bioinformatic analysis of TssA-like proteins associated with T6SS. I decided to start the two projects in parallel. 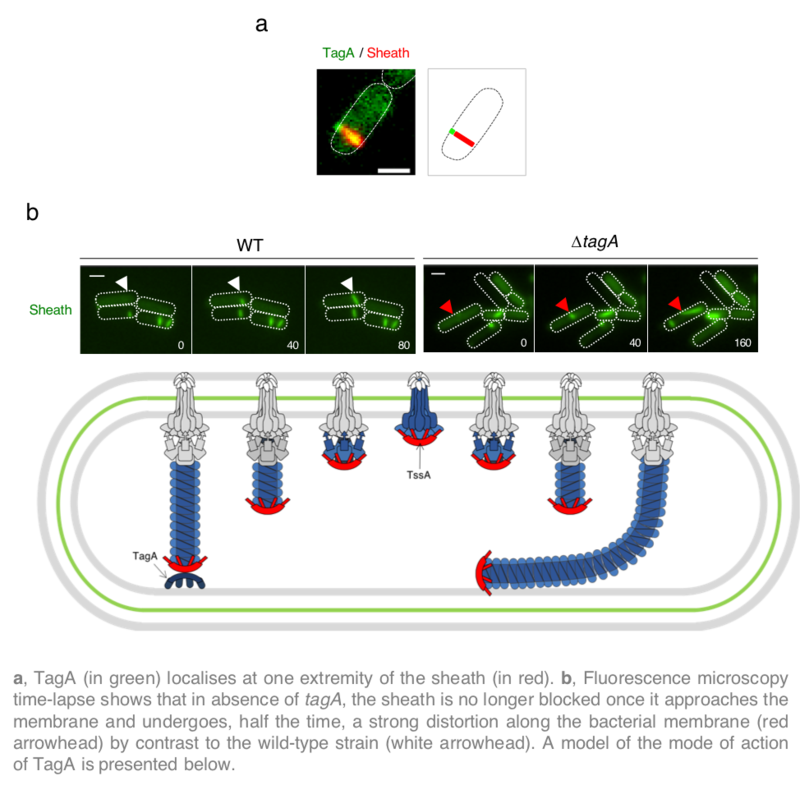 I started the TagA project from scratch as we did not have any tool or construct for this gene in the lab. It took six months to accumulate data on TagA: I found that TagA was important but not essential for T6SS, that it associates with membranes and localizes in foci. After engineering a chromosomal APEX2-TssA fusion and optimizing biotin-phenol and hydrogen peroxyde concentrations, I finally succeeded to use APEX in whole bacterial cells at the end of my master thesis. I rapidly brought the samples to Régine, the head of the mass spectrometry facility of our institute. After two very long weeks waiting for the results, we received the Excel sheets from Régine. We were all astonished by the quality and reproducibility of the data and by the power of the APEX approach. I was so excited to find out identified proteins and to see T6SS proteins known to interact or to be at the vicinity of TssA as best hits! I have to say that it is the best moment in my young life as a scientist. But the pleasure did not stop here. A close examination of the best hits unveiled an unknown protein entitled conserved hypothetical protein [OS=Escherichia coli 042] 284924271. Guess what is this protein? TagA! The two projects meet each other! Finally, by testing APEX2-TssA-dependent biotinylation in different strain backgrounds, we defined that TagA is at proximity of TssA during the late stages of tail completion. With the help of Thierry and Leon, I conducted fluorescence microscopy experiments that showed that TagA is captured by the distal end of the sheath when in contact with the membrane, and that the sheath either undergoes a strong distortion or contracts immediately after completion in absence of TagA (Figure). We had identified the long-awaited T6SS clamp that blocks polymerization of the sheath and maintains the tensile forces that may be required for efficient firing. 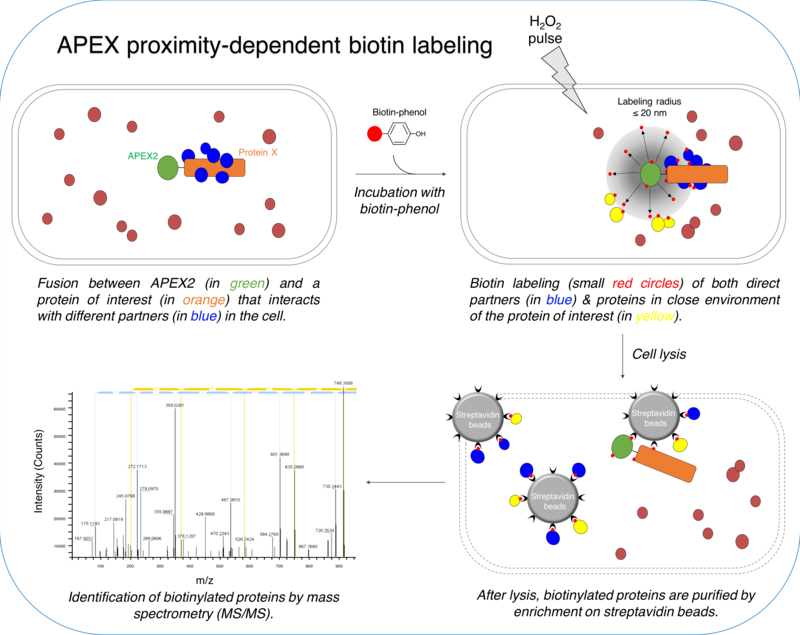 I now hope that the development of APEX proximity-dependent biotin labeling in bacteria will be useful for the microbiology community, and I am glad to share this technology with all of you! PhD student working on type VI secretion system in Cascales lab. Always ready to learn more about bacteria, I perform molecular biology, genetics, labeling assay (APEX) and fluorescence microscopy to answer my questions !